Alamuri Ratnamala Institute Thane (Alamuri Ratnamala Engineering & Technology Institute Thane), Thane Published Job Notification for 67 Professor – Associate Professor & More Posts. Candidates who wish to apply must look at Alamuri Ratnamala Institute Thane Professor – Associate Professor & More Recruitment 2018. Eligible candidates can apply Offline before 26-07-2018. Education Qualification: Qualification as per the university of Mumbai, AICTE & DTE. 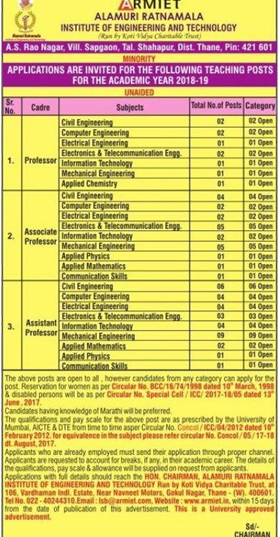 Starting Date, Last Date to Apply Offline at Alamuri Ratnamala Engineering & Technology Institute Thane which candidates should be remembers as follows.